Are you looking for a carpet cleaning contractor who is qualified to undertake any carpet cleaning job and give you the results you hope for? You should feel free to get in touch with our company right away. This is what we do best. We are a cleaning agency that is located in London and we provide outstanding carpet cleaning services in the entire area. Whether your carpets are just in need of a proper cleaning or they have gotten stains or they are starting to smell bad or they are looking a bit dull and you want to refresh them, we can do it all. We have been cleaning carpets for many years and we have the knowledge and experience in how to adequately take care of various cleaning problems on different kinds of carpets. Our cleaning teams have been trained, they are also equipped with steam cleaning machines and cleaning detergents that are not harmful to your carpets. What is more, our teams have eco-friendly cleaning products at their disposal and they will use them to remove all cleaning problems from your carpets. This is one of the benefits you will enjoy when you use the best carpet cleaning service in London – ours. You can rest assured that your carpets will be fresh and will look new again. Our cleaning team will inspect your carpets and their problems, choose the best products to use on them and will get to work. They will pre-treat any stain or spot that has to be taken care of, they will use modern steam cleaning machine to clean your carpets in depth and eliminate dirt from beneath the surface, etc. 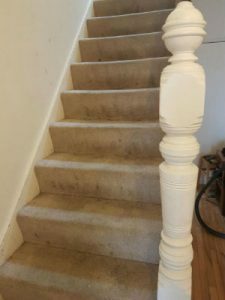 Our company prides itself on its efficiency rate and we work extremely hard and diligently to be able to provide all of our customers with pleasing results and give them the carpets that will improve their homes. Our service is efficient at getting rid of allergens, grime, soil, stains and spots, bacteria, discolouration, etc. Give us a call now.